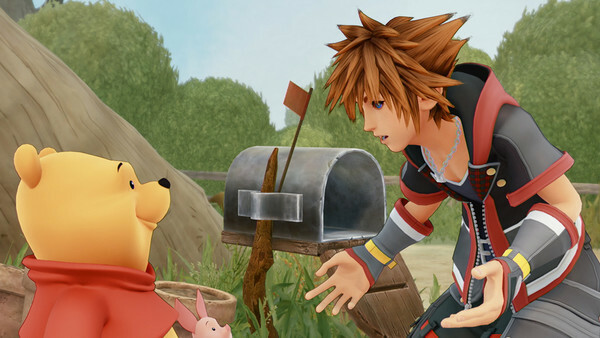 This world barely counts because it's basically just a short, half-hour breather between two other "proper" worlds, but 100 Acre Wood is nevertheless a small, Disney-themed locale which the player can roam around while talking to its iconic inhabitants and playing a few mini-games. Though it's always fun to see Winnie the Pooh and co. doing their thing, the world basically just consists of racing through a series of short, repetitive mini-games, namely a charmless rip-off of the classic puzzle game Bubble Bobble. The vaguely cel-shaded look helps it stand out from the other worlds aesthetically, but otherwise this is a glorified stop-gap that exists simply to shoehorn A. A. Milne's beloved creations into the game for a beat.